The 2014 season was the Minnesota Vikings' 54th in the National Football League and their first under head coach Mike Zimmer. It was the first of two seasons in which the Vikings played at the outdoor TCF Bank Stadium on the campus of the University of Minnesota. Construction of U.S. Bank Stadium began on the site of the team's former home, the Hubert H. Humphrey Metrodome, with a target of opening for the 2016 season. ^ a b c The Vikings traded their original first-round selection (No. 8 overall) to the Cleveland Browns in exchange for the Browns' first- and fifth-round selections — Nos. 9 and 145 overall. The No. 9 selection had previously been acquired by the Browns in a trade with the Buffalo Bills. ^ a b c The Vikings traded their second- and fourth-round selections (Nos. 40 and 108 overall, respectively) to the Seattle Seahawks in exchange for the Seahawks' first-round selection (No. 32 overall). ^ The Vikings acquired this third-round selection as part of a 2013 trade that sent wide receiver Percy Harvin to the Seattle Seahawks. ^ a b c d e f The Vikings traded their original fifth-round selection (No. 148 overall) to the Carolina Panthers in exchange for the Panthers' fifth- and seventh-round selections — Nos. 168 and 225 overall. The No. 225 selection had previously been acquired by the Panthers in a trade that sent linebacker Jon Beason to the New York Giants. The Vikings then traded the No. 168 selection to the Atlanta Falcons in exchange for the Falcons' sixth- and seventh-round selections (Nos. 182 and 220 overall, respectively). MIN – Blair Walsh 25-yard field goal, 14:06. Saints 13–3. Drive: 13 plays, 71 yards, 5:44. MIN – Blair Walsh 30-yard field goal, 6:28. Saints 13–6. Drive: 10 plays, 51 yards, 5:47. MIN – Blair Walsh 40-yard field goal, 10:20. Saints 13–9. Drive: 10 plays, 43 yards, 4:40. NO – Marques Colston 18-yard pass from Drew Brees (Shayne Graham kick), 12:22. Saints 20–9. Drive: 12 plays, 90 yards, 5:28. MIN – Blair Walsh 39-yard field goal, 8:55. Vikings 31–13. Drive: 6 plays, 19 yards, 3:25. ^ a b c Seattle, Green Bay and Dallas were ranked in seeds 1–3 based on conference record. ^ a b Arizona defeated Detroit head-to-head (Week 11, 14–6). ^ a b New Orleans defeated Minnesota head-to-head (Week 3, 20–9). ^ CCNorseman (January 5, 2014). "Vikings 2013 Season Grades: Defense and Special Teams". Daily Norseman. Vox Media. Retrieved September 8, 2014. ^ Sessler, Marc (May 8, 2014). "Justin Gilbert drafted No. 8 by Browns after trade". Around the League (blog). NFL.com. Retrieved May 8, 2014. ^ a b Goessling, Ben (May 20, 2014). "Vikings sign QB Teddy Bridgewater". ESPN.com. Retrieved May 20, 2014. ^ Patra, Kevin (May 8, 2014). "Vikings draft Teddy Bridgewater after missing Manziel". NFL.com. National Football League. Retrieved May 9, 2014. ^ Goessling, Ben (May 22, 2014). "Vikings: Scott Crichton tweets he's signed". ESPN.com. Retrieved May 25, 2014. ^ Goessling, Ben (June 10, 2014). "Vikings sign Jerick McKinnon". ESPN.com. Retrieved June 11, 2014. ^ Sessler, Marc (March 11, 2013). "Vikings agree to trade Percy Harvin to 'Hawks for picks". NFL.com. National Football League. Retrieved March 11, 2013. ^ a b c Tomasson, Chris (May 16, 2014). "Vikings sign three of their 10 draft picks". TwinCities.com. Pioneer Press. Retrieved May 16, 2014. ^ "2014 NFL Draft trade tracker: Details of all the moves". NFL.com. National Football League. May 10, 2014. Retrieved May 10, 2014. ^ Yotter, Tim (May 21, 2014). "Vikings sign Exum; two draft picks remain". Scout.com. Retrieved May 21, 2014. ^ a b c d "Minnesota Vikings Contracts". Spotrac.com. Retrieved May 20, 2014. ^ a b Tomasson, Chris (December 30, 2013). "Minnesota Vikings sign 6 players to reserve/future contracts". TwinCities.com. Pioneer Press. Retrieved January 26, 2014. ^ "Vikings re-sign CB/PR Marcus Sherels". USAToday.com. March 7, 2014. Retrieved March 7, 2014. ^ Goessling, Ben (March 11, 2014). "Breaking down Marcus Sherels' new deal". ESPN.com. ESPN Internet Ventures. Retrieved March 16, 2014. ^ Goessling, Ben (March 7, 2014). "Cassel brings Vikings back from QB brink". ESPN.com. Retrieved March 7, 2014. ^ Goessling, Ben (March 9, 2014). "Everson Griffen gets $42.5M deal". ESPN.com. Retrieved March 9, 2014. ^ "Joe Berger: Current Salary Information". Spotrac.com. Retrieved March 17, 2014. ^ Tabbert, Nick (March 14, 2014). "Vikings Re-Sign WR Jerome Simpson". KSTP-TV. Retrieved March 16, 2014. ^ "Jerome Simpson: Current Salary Information". Spotrac.com. Retrieved April 27, 2014. ^ Tomasson, Chris (March 15, 2014). "Vikings do a little juggling, keep Johnson". TwinCities.com. Pioneer Press. Retrieved March 16, 2014. ^ Tesfatsion, Master (March 5, 2014). "Vikings tender RB Matt Asiata". StarTribune.com. Retrieved March 5, 2014. ^ a b c d e Krammer, Andrew (August 31, 2014). "Vikings moves: MarQueis Gray claimed and practice squad additions". 1500ESPN.com. Archived from the original on September 3, 2014. Retrieved August 31, 2014. ^ a b Zinski, Dan (September 2, 2014). "Vikings Waive Kendall James from Practice Squad, Add Austin Wentworth". TheVikingAge.com. Retrieved September 2, 2014. ^ Krammer, Andrew (September 16, 2014). "Vikings sign fullback Zach Line to the practice squad". 1500ESPN.com. Archived from the original on September 18, 2014. Retrieved September 23, 2014. ^ a b c Zinski, Dan (October 7, 2014). "Vikings Cut McLeod Bethel-Thompson from Practice Squad, Sign Pierre Warren". Retrieved October 7, 2014. ^ Tomasson, Chris (November 12, 2014). "Vikings re-sign Ryan Otten to practice squad". TwinCities.com. Pioneer Press. Retrieved November 12, 2014. ^ a b Hasan, Arif (November 18, 2014). "2014 MINNESOTA VIKINGS: VIKINGS SIGN RB DOMINIQUE WILLIAMS TO PRACTICE SQUAD". VikingsTerritory.com. Retrieved November 18, 2014. ^ Goessling, Ben (February 7, 2014). "Erin Henderson cut by Vikings". ESPN.com. Retrieved February 7, 2014. ^ Wesseling, Chris (March 4, 2014). "John Carlson reportedly to be cut by Minnesota Vikings". NFL.com. Retrieved March 5, 2014. ^ Gantt, Darin (March 7, 2014). "Cardinals sign tight end John Carlson". NBCSports.com. Retrieved March 7, 2014. ^ Patra, Kevin (March 6, 2014). "Minnesota Vikings release Letroy Guion, Greg Childs". NFL.com. Retrieved March 17, 2014. ^ Zicarelli, Frank (September 10, 2014). "Argos hopeful aerial game not a lost cause". TorontoSun.com. Retrieved October 1, 2014. ^ "Packers add free agent DT Letroy Guion". WashingtonPost.com. March 17, 2014. Retrieved March 17, 2014. ^ Patra, Kevin (August 14, 2014). "Desmond Bishop signed by Arizona Cardinals". NFL.com. Retrieved August 14, 2014. ^ Breech, John (March 12, 2014). "RB Toby Gerhart agrees to terms on three-year deal with Jaguars". CBSSports.com. Retrieved March 12, 2014. ^ Tomasson, Chris (March 14, 2014). "Minnesota Vikings: Chris Cook signs with 49ers". TwinCities.com. St. Paul Pioneer Press. Retrieved March 16, 2014. ^ Wilson, Aaron (March 21, 2014). "Panthers sign quarterback Joe Webb to one-year deal". NationalFootballPost.com. Archived from the original on March 22, 2014. Retrieved March 21, 2014. ^ Goessling, Ben (March 26, 2014). "Jared Allen heading to Bears". ESPN.com. Retrieved March 26, 2014. ^ Caplan, Adam (April 16, 2014). "Josh Freeman, Giants agree to deal". ESPN.com. Retrieved April 16, 2014. ^ Wesseling, Chris (June 16, 2014). "Kevin Williams turned down more money from Patriots". NFL.com. Retrieved June 17, 2014. ^ a b c d e f g h i j Glover, Ted (August 25, 2014). "Minnesota Vikings Roster Cuts 2014: Vikings Begin Shaping The Roster". DailyNorseman.com. Retrieved August 25, 2014. ^ "Chiefs Announce Roster Moves". KCChiefs.com. September 9, 2014. Retrieved October 1, 2014. ^ a b c d e f g h i j Tomasson, Chris (August 30, 2014). "Minnesota Vikings: Fred Evans cut, Jamarca Sanford placed on IR". TwinCities.com. Pioneer Press. Retrieved August 30, 2014. ^ Kirkendall, Josh (October 8, 2014). "Cincinnati Bengals sign Jeff Baca to practice squad". CincyJungle.com. Retrieved November 5, 2014. ^ Goessling, Ben (September 8, 2014). "Vikings cut Sanford after injury settlement". ESPN.com. Retrieved September 8, 2014. ^ Jones, Mike (September 29, 2014). "Redskins sign safety Jamarca Sanford, mostly for special teams". WashingtonPost.com. Retrieved October 1, 2014. ^ a b "Vikings sign WR Charles Johnson to replace Jerome Simpson". FoxSports.com. September 20, 2014. Retrieved September 23, 2014. ^ "Vikings at Packers: Vikings Promote QB Chandler Harnish, waive WR Rodney Smith (UPDATE: TEDDY NOT PLAYING)". VikingsTerritory.com. October 2, 2014. Retrieved October 3, 2014. ^ Wilkening, Mike (October 3, 2014). "Browns awarded WR Rodney Smith on waivers from Minnesota". NBCSports.com. Retrieved October 10, 2014. ^ a b Tomasson, Chris (January 3, 2014). "Vikings sign free agents Kamar Jorden, Josh Samuda". TwinCities.com. Pioneer Press. Retrieved January 26, 2014. ^ "Josh Samuda: Current Salary Information". Spotrac.com. Retrieved March 18, 2014. ^ Patra, Kevin (March 9, 2014). "Report: Minnesota Vikings sign LB Jasper Brinkley". NFL.com. Retrieved March 9, 2014. ^ "Jasper Brinkley: Current Salary Information". Spotrac.com. Retrieved March 18, 2014. ^ "Linval Joseph to Vikings for $31.5M". ESPN.com. March 11, 2014. Retrieved March 11, 2014. ^ Carlson, Adam (March 13, 2014). "Vikings Sign CB Captain Munnerlyn To Three Year Deal". TheVikingAge.com. Retrieved March 13, 2014. ^ Carlson, Adam (March 19, 2014). "Vikings Agree To Terms With DT Tom Johnson". TheVikingAge.com. Retrieved March 19, 2014. ^ "Vikings agree with Corey Wootton". ESPN.com. March 20, 2014. Retrieved March 21, 2014. ^ Gantt, Darin (March 24, 2014). "Vikings sign former Jets lineman Vladimir Ducasse". NBCSports.com. Retrieved March 25, 2014. ^ "Vlad Ducasse: view contract details". RoroWorld.com. Retrieved April 8, 2014. ^ "Vikings sign former Texans wide receiver Lestar Jean". FoxNews.com. April 8, 2014. Retrieved April 8, 2014. ^ "Lestar Jean: Current Salary Information". Spotrac.com. Retrieved April 27, 2014. ^ a b c d e Yotter, Tim (May 13, 2014). "Vikings release four, sign 15 rookies". Scout.com. Retrieved May 13, 2014. ^ a b c d Alper, Josh (May 19, 2014). "Vikings sign Mike Zimmer, the player". NBCSports.com. Retrieved May 19, 2014. ^ a b Tomasson, Chris (August 18, 2014). "Vikings waive injured LB Dom DeCicco, pickup LB Justin Jackson off waivers". TwinCities.com. Pioneer Press. Retrieved August 18, 2014. ^ Tomasson, Chris (September 9, 2014). "Vikings sign linebacker Josh Kaddu to practice squad". TwinCities.com. Retrieved September 9, 2014. ^ a b c Vensel, Matt (November 3, 2014). "Vikings add two to practice squad, including QB Devlin". StarTribune.com. Retrieved November 3, 2014. ^ Goessling, Ben (December 7, 2014). "Rookie Jerick McKinnon placed on IR". ESPN.com. Retrieved December 7, 2014. ^ Tomasson, Chris (December 10, 2014). "Vikings place linebacker Michael Mauti on injured reserve, sign tackle Carter Bykowski". ESPN.com. Retrieved December 10, 2014. ^ a b Gates, Christopher (December 17, 2014). "Minnesota Vikings Promote Ahmad Dixon, Sign Jordan McCray". ESPN.com. Retrieved December 17, 2014. ^ a b Tomasson, Chris (December 24, 2014). "Vikings sign RB Henry Josey off Jacksonville practice squad". TwinCities.com. Retrieved December 24, 2014. ^ a b Goessling, Ben (June 2, 2014). "Vikings claim Julian Posey off waivers". ESPN.com. Retrieved June 2, 2014. ^ a b Goessling, Ben (July 23, 2014). "Vikings cut Nealy, sign Higgins". ESPN.com. Retrieved July 23, 2014. ^ "Kamar Jorden: Current Salary Information". Spotrac.com. Retrieved March 18, 2014. ^ Tomasson, Chris (January 23, 2014). "Vikings: Mike Priefer reportedly staying on coaching staff". TwinCities.com. Pioneer Press. Retrieved January 26, 2014. ^ "Kheeston Randall: Current Salary Information". Spotrac.com. Retrieved March 18, 2014. ^ Wilkening, Mike (February 11, 2014). "Vikings sign linebacker Simoni Lawrence". NBCSports.com. Retrieved February 11, 2014. ^ "Simoni Lawrence: Current Salary Information". Spotrac.com. Retrieved March 18, 2014. ^ Alper, Josh (March 10, 2014). "Larry Dean avoids restricted free agency, re-signs with Vikings". NBCSports.com. Retrieved March 10, 2014. ^ "Larry Dean: Current Salary Information". Spotrac.com. Retrieved March 18, 2014. ^ Goessling, Ben (March 13, 2014). "Source: Fred Evans re-signs with Viking". ESPN.com. Retrieved March 13, 2014. ^ "Fred Evans: Current Salary Information". Spotrac.com. Retrieved March 18, 2014. ^ Gehlken, Michael (March 13, 2014). "Derek Cox finds new home". UTSanDiego.com. Retrieved March 13, 2014. ^ a b Hall, Brian (April 15, 2014). "Vikings sign TE Reisner, claim LB Manning off waivers". FoxSports.com. Retrieved April 19, 2014. ^ "Terrell Manning: Current Salary Information". Spotrac.com. Retrieved April 27, 2014. ^ "Allen Reisner: Current Salary Information". Spotrac.com. Retrieved April 27, 2014. ^ "Vikings agree to one-year deal with safety Kurt Coleman". FoxSports.com. April 14, 2014. Retrieved April 14, 2014. ^ "Kurt Coleman: Current Salary Information". Spotrac.com. Retrieved April 27, 2014. ^ a b Tomasson, Chris (August 4, 2014). "Vikings sign veteran safety Chris Crocker, release rookie defensive end Rakim Cox". TwinCities.com. Pioneer Press. Retrieved August 5, 2014. ^ a b c Krammer, Andrew (July 25, 2014). "Vikings waive T Matt Hall, WR Josh Cooper and add a pair of receivers". 1500ESPN.com. Archived from the original on 2014-08-08. Retrieved July 25, 2014. ^ Tomasson, Chris (August 6, 2014). "Vikings waive tight end A.C. Leonard". TwinCities.com. Pioneer Press. Retrieved August 6, 2014. ^ Alper, Josh (June 13, 2014). "Vikings sign Josh Cooper". NBCSports.com. Retrieved June 13, 2014. ^ Tomasson, Chris (August 26, 2014). "Vikings cut tight end Mike Higgins". TwinCities.com. Pioneer Press. Retrieved August 26, 2014. ^ Goessling, Ben (August 10, 2014). "Vikings sign tight end Kory Sperry". ESPN.com. Retrieved August 11, 2014. ^ a b Carlson, Adam (September 29, 2014). "Vikings Sign QB Chandler Harnish To Practice Squad, Cut WR Donte Foster". TheVikingAge.com. Retrieved October 1, 2014. ^ a b Zinski, Dan (September 3, 2014). "Vikings Add Cowboys 7th Round Pick Ahmad Dixon to Practice Squad". TheVikingAge.com. Retrieved September 3, 2014. ^ a b Tomasson, Chris (November 19, 2014). "Vikings claim running back Ben Tate off waivers, release MarQueis Gray". TwinCities.com. Pioneer Press. Retrieved November 19, 2014. ^ Krammer, Andrew (September 1, 2014). "Vikings add a cornerback to fill out the 10-man practice squad". 1500ESPN.com. Archived from the original on September 3, 2014. Retrieved September 1, 2014. ^ "Bears sign Dixon off Viking practice squad". ChicagoTribune.com. September 8, 2014. Retrieved September 8, 2014. ^ Zulgad, Judd (September 24, 2014). "Vikings place Matt Cassel, Brandon Fusco on injured reserve". 1500ESPN.com. Archived from the original on October 12, 2014. Retrieved September 24, 2014. ^ Tesfatsion, Master (October 3, 2014). "Vikings waive QB Chandler Harnish". StarTribune.com. Retrieved October 3, 2014. ^ Blunt, Terry (November 11, 2014). "Former John Adams football player Rashaun Allen signs with Seattle Seahawks". ESPN.com. Retrieved November 11, 2014. ^ Sessler, Marc (December 23, 2014). "Ben Tate released by Minnesota Vikings". NFL.com. Retrieved December 23, 2014. ^ Tomasson, Chris (November 25, 2014). "Tackle J'Marcus Webb rejoins Vikings, replaces Phil Loadholt". TwinCities.com. Retrieved November 25, 2014. ^ Miller, Chris (December 16, 2014). "Vikings waive J'Marcus Webb". StarTribune.com. Retrieved December 16, 2014. ^ Glenza, Jessica (September 12, 2014). "NFL star Adrian Peterson charged with injuring his son". theguardian.com. Guardian News and Media. ^ "Minnesota Vikings Team Statistics". 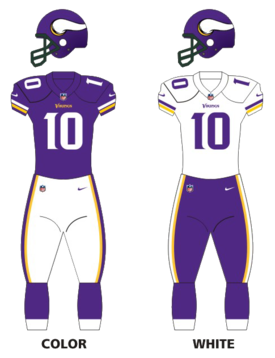 Minnesota Vikings. December 30, 2014. Retrieved December 30, 2014. ^ "NFL.com Statistics". NFL.com. December 30, 2014. Retrieved December 30, 2014. This page was last edited on 19 April 2019, at 19:24 (UTC).